Derek Navis and Korey Sprengel scored a huge double victory on Bays de Noc Aug. 5-6, sweeping top honors in the Cabela's National Team Championship and Cabela's Masters Walleye Circuit Central Division Qualifier. 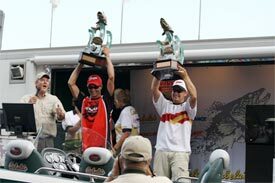 The Cabela's NTC is one of the most prestigious walleye tournaments in the country. Teams qualify by accumulating points through competition in local tournaments organized by more than 50 sanctioned grassroots walleye clubs across the United States. Now in its 27th season, the Cabela's Masters Walleye Circuit is the longest-running professional walleye tournament circuit in the United States-running three divisions, nine qualifiers and a $100,000 no-entry-fee World Walleye Championship. This was the tenth edition of the NTC and marked the fourth time that the Cabela's NTC and Cabela's MWC paired up to host two tournaments in one. A total of 275 teams from across the U.S. and Canada gathered to battle for more than $300,000 in cash and prizes. Navis and Sprengel brought a 30-pound-plus basket to the Cabela's stage on both days, tallying a 64.41-pound, 10-fish limit. The catch yielded a phenomenal payday for the young Wisconsin anglers. For the Cabela's NTC win, Navis, of Waupun, and Sprengel, of Beaver Dam, earned $30,000 in cash, a Cabela's 50th anniversary-edition Ranger 619 rigged with an Evinrude E-tec motor (worth a total of $65,000), a $350 contingency from PRADCO Outdoor Brands, and a $250 Cabela's gift card for Big Basket on Day Two. Incredibly, Navis and Sprengel also won an identical Ranger for being the top-placing Ranger Cup team in the NTC. On the Cabela's MWC front, the pair won $18,330 in first-place cash, plus $1,000 through the Ranger Cup program, a $500 Lowrance Electronics HDS/Elite DSI contingency, $500 Berkley Baits Prize Package, and U2/The Oxygenator bonus. In all, Navis and Sprengel walked away with more than $180,000 in winnings. "It's great to win it all, but it's going to take awhile to sink in," said Sprengel. "This is unbelievable, added Navis. "If I could pick any event to win, this would be it." Lindy Beads in a variety of shades including chartreuse, purple and gold depending on light conditions. They also put together solid programs jigging 4-inch Berkley Gulp! Minnows near the Minneapolis Lighthouse, as well as trolling Berkley Flicker Shads. Sprengel also credited their Lowrance HDS electronics. "Lowrance was critical, because finding pods of walleyes was the biggest key to winning," he said, noting that scattered fish were fairly common, but true schools necessary to bring in a heavy tournament basket were a rare commodity. They also credited the fuel-stingy Mercury OptiMax powering their 620 Ranger for allowing them to make long runs in search of fish. "We put on a lot of miles running and gunning, but we barely used half a tank of gas," said Sprengel. South Dakotans Cale Corbin, of Madison, and Chad Schilling, of Akaska, finished second in both the Cabela's NTC and MWC events, earning a total of $20,100 in cash payouts plus $6,000 in Cabela's gift cards through the Cabela's Angler Cash program. The total Cabela's NTC payout included $121,000 in cash paid to the top 50 teams, plus $20,000 in gift cards awarded to the remainder of the field. On Day Two of the tournament, Cabela's NTC co-tournament director Lara Herboldsheimer announced that the 2012 Cabela's NTC will be held June 1-3 on Mille Lacs Lake out of Isle, Minnesota. The 128,000-acre walleye factory offers a variety of fishing options in early June, ranging from near-shore weeds and rocks to offshore rock, gravel and its world-famous mud flats. In other MWC winnings, Glenn and Carol Chenier, both of Gladstone, Michigan, added a $300 Worldwide Marine Insurance bonus to their $3,000 sixth-place payout. Right behind the Cheniers, John Schneider of Shawano, Wisconsin, and John Hazen of Bay City, Michigan, nabbed a portable Oxygenator unit for being the highest finishers running an Oxygenator in their livewell. In 13th place, Ryan and Tom Jirik added a $500 first-place Cabela's MWC Premier Team award to their $1,600 cash paycheck. And David Harmon of Omaha, Nebraska, and Scott Busteed of Windsor, Colorado, won a $250 Comeback Award sponsored by the Delta County Chamber of Commerce and Bays de Noc CVB. The Cabela's MWC also crowned its Central Division Teams of the Year. Ron Levin and Nick Ingoglia, both of Beach Park, Illinois, claimed $4,504.50 for overall Team of the Year honors in the Division. Daniel Christensen and Tammy Klopotek brought home the Husband and Wife title, Tom and Ryan Jirik were named Father and Son Team of the Year, and Brian and Mark Mazur won Brothers Team of the Year. In all, the top 27 Cabela's MWC teams shared the $70,720 payout, plus bonuses, Big-Fish payouts and team of the year awards pushing the total to more than $80,000. Anglers Association presented a Youth & Family Fishing Clinic immediately after the Day One weigh-in. Young walleye fans received rods and reels donated by the NPAA, along with NPAA/MWC Future Pro shirts, and tackle packages courtesy of Northland Fishing Tackle.